Andrassy is the first horse Allison Sheehan bred and the mare could become the trainer's first black-type winner when she runs in the How Now Stakes. 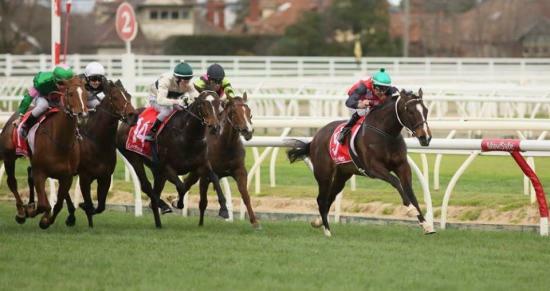 The five-year-old returns to Caulfield for Saturday's Group Three 1200m-race having finished just over a length from the winner when fourth in the Group Three Cockram Stakes over the same course and distance last month. By Sharkbite out of Pride Of Androssan, the mare has two wins and two fourths from her four starts at the track and Sheehan says Andrassy has had a faultless lead-in to Saturday. "We hadn't planned to lead the other day but she began so well and sort of got left there," Sheehan said. "We think she'll be better if there's speed on and she can be ridden with a bit of cover and have something to chase in the home straight." Sheehan prepares a team of eight horses at Cranbourne and isn't worried about Andrassy drawing the outside gate in a field of 11. "She'll go from anywhere," Sheehan said. "She jumps well and then Ben (Melham) will be able to put her wherever he wants her. She's always quick out of the gates. "I'm hoping there will be genuine speed on, and in this grade of race there should be enough speed on for her just to get some nice cover." Sheehan said Andrassy would also appreciate give in the track with the surface currently in the soft range. "I think she's a nice each-way chance," Sheehan said. "Hopefully we can finish in the placings at least this time. She's had a faultless preparation from her last start to this one." Andrassy has won six races so far including four in town and Sheehan admits a stakes win would be special. "She is the first horse I bred and raced," Sheehan said. The trainer also prepares Andrassy's four-year-old brother Jawsome, who has raced six times for a Pakenham maiden win, and she has another two fillies out of Pride Of Androssan.